No wait...shopping for tonights evening meal in the supermarket they had a range of christmas beers out already, a bit early is it not ? I refuse to have a xmas brew at least until the 1st Nov. 2 years ago I did a 100 different xmas beers before xmas challenge thing, last year I did 50 (i was still recovering from an intestine infection, friggin painful btw). This year I will pick and choose very carefully as last years were to be honest, mainly crap due to over use of orange peel in a whole lot of brews. According to pre-blog notes, Delirium - Noel got the biggest nod last year. Big citrusy hop and pine aroma along with roasted malt, coffee and chocolate from the pour. BHB pours black with a creamy brown head. Quite a sweet intake with strong coffee, dark dark chocolate, roasted malt and grapefruit leading to a heavily roasted and hoppy bitter finish. Long lingering aftertaste of strong coffee, dark bitter chocolate again and some floral hops. Low carbonation, medium bodied and has quite a light oily mouthfeel. Despite the warming presence, no alcohol shines through to disturb any of the flavours. 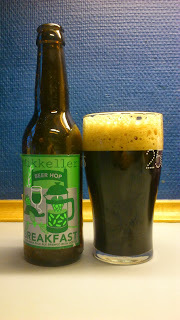 It says black IPA on the bottle..I dunno why it does not just say extra hopped coffee stout :) I can't remember ever drinking a duffer from Mikkeller, maybe the Tjekket pils was a bit boring, but apart from that I have enjoyed and liked nearly everyone I have drunk, this being no exception. Very tasty and easy to drink despite the highish abv. While not quite reaching the level of the beer geek brews I would have no problem drinking this again. If you can find it it is worth a try. This scored a solid 8/10 on the ' beer geeks, we're just not for christmas you know' Beerometer. Where to buy CPH : Bought at Kihoskh, Sønder Boulevard 53, Kbh V about a month ago. Interlude - What's going on ?